Hello and welcome to live updates from all eight of tonight's Champions League matches. We'll have every goal as it happens with updates focusing on the Manchester City's match with Sevilla and the heavyweight clash between Paris Saint-Germain and Real Madrid. We should be expecting some team news in the next 20 minutes or so, don't go away. What we know is that Real Madrid are missing a host of stars including two-thirds of the BBC - Gareth Bale and Karim Benzema are leaving Cristiano Ronaldo to do it on his own (does he ever do it differently?). Sevilla: Rico, Coke, Andreolli, Rami, Tremoulinas, N'Zonzi, Krychowiak, Konoplyanka, Banega, Vitolo, Gameiro. Paris Saint-Germain are certainly taking their time. Sacre bleu the PSG team has finally landed. 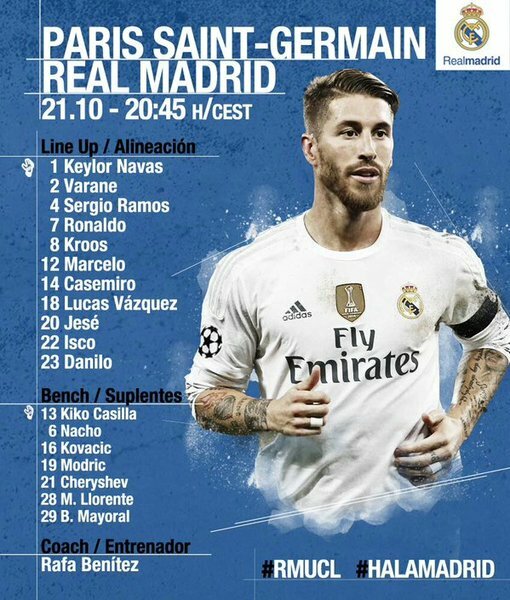 Trapp, Aurier, Silva, Marquinhos, Maxwell, Verratti, Motta, Matuidi, Di Maria, Ibrahimovic, Zlatan. We've got 15 minutes until the whistle blows around the grounds. GOAL! Nicolas Gaitan puts Benfica in the lead at Galatasaray after just two minutes - 0-1. Gaitan's goal is the quickest in the Champions League so far this season. There's a handball in the game in Moscow... but it's against Manchester United - Anthony Martial handles! GOAL! Heartbreak for David De Gea! The Spaniard saves the spot-kick but the rebound is turned in by Doumbia - 1-0! 15mins: Not a lot of action in Paris at the moment Thiago Silva has just gone closest but, in truth, his header from a free-kick was well over the top. 17mins: Manchester City almost concede - Sevilla hit the post and then Hart has to make a smart save at his near post straight away. Still 0-0 at the Etihad. GOAL! Markus Rosenburg puts Malmo into a shock lead at home against Shakhtar - 1-0! GOAL! Galatasaray equalise against Benfica - Selcuk Inan converting from the spot to make it 1-1. 22mins: Real Madrid definitely controlling possession in Paris, with PSG more than happy to sit back, soak up the pressure and try and hit the Spanish on the counter. Toni Kroos has just flashed a long-range shot at goal but it's always going wide. Tense affair so far. GOAL! Atletico Madrid take the lead against minnows Astana, Niguez with a cheeky flick to make it 1-0! GOAL! Manchester City are behind , Konoplyanka is alone in the box and applies a simple finish - 0-1! 28mins: As that City goal was going in Real Madrid also had a great chance through Jese, after he was set through one-on-one - but Kevin Trapp was quickly out and able to save with his feet. Still 0-0. GOAL! Atletico Madrid have another - Jackson Martinez makes it 2-0! GOAL! Galatasaray have scored again to go in front against Benfica - Lukas Podolski with a lovely finish makes it 2-1! GOAL! Wilfried Bony equalises for Manchester City (maybe an own goal?) to make it 1-1 against Sevilla! 35mins: Real Madrid starting to exert some real pressure and have Kevin Trapp again to thank for keeping this one scoreless. A corner is swung in and Cristiano Ronaldo's powerful header is tipped other with the slightest of fingers to go over the top. 0-0. We're back underway around Europe. GOAL! Wolfsburg have taken the lead against PSV - Bas Dost on target! This group, containing Man United, is wide open! A slight techincal issue, sorry for the delay. Edinson Cavani went close a couple of minutes ago, stealing ahead of Raphael Varane at the front post to get a toe on the end of Motta's low cross - but it goes wide. 55mins: Both teams starting to push now, it's got much more open in the last couple of minutes. These two are more than likely going through in Group A no matter the result. GOAL! Wolfsburg have another - Max Kruse makes it 2-0! If results stay the same that would leave Manchester United sitting bottom of Group B after three matches. 60mins: Cristiano Ronaldo and Zlatan Ibrahimovic step up from long-range for a pair of free-kicks. 64mins: PSG so much better in this half, they are definitely out to win this game - Maxwell gets into space down the left and delivers for Ibrahimovic, but his header is too high. GOAL! Game over in Madrid as Atletico make it 3-0 against Astana through Oliver Torres. GOAL! Anthony Martial makes amends for that earlier handball by heading in an equaliser in Russia - 1-1! Juventus are being frustrated by Borussia Monchengladbach - 20 minutes to go in Turin. 75mins: Frustrating night in Paris, both teams appear to have gone back into their shells again. After that little bit of PSG pressure they are no longer as willing to throw men forward. Would not be surprised if this one ends up goalless. The goals have definitely dried up across Europe. Hopefully that works as a sort of reverse commentators curse that means we get some action. GOAL! But it's not one that means anything unfortunately. Atletico Madrid go 4-0 up through a Dedechko own goal. Into injury time in most of the games now. There was a bit of light relief in Paris as a pitch invader made his way onto the field, but it was all over too quickly. GOAL! Kevin De Bruyne wins it for Manchester City! The Belgian scores in injury time to put his side 2-1 up over Sevilla - what a crucial goal that could be! Thanks very much for joining us tonight - head back to the home page where you'll soon find all the reports, reaction and ratings you could want.